Q. We took a six-minute video of the total solar eclipse last August on an iPhone 6s. How do I send it to other phones and devices, or is it simply too large a file? And what’s the best way to get it off the phone so it can be preserved in perpetuity? A. Many email systems limit file attachments to 25 megabytes or less, which is a much smaller size than six minutes of video recorded on an iPhone. Even at the phone’s lower 720p HD setting, Apple estimates one minute of video requires 40 megabytes of space. One minute recorded at the highest 4K setting can result in a 400-megabyte file. Still, there are several ways to free the eclipse clip from the confines of the phone, even without buying a third-party program to transfer files to the computer. For example, you can use Apple’s free iTunes software and the USB cable that came with the phone to connect the device to a Windows PC or Mac and import the full video to the computer — where it can be archived, posted online, backed up, burned to disc or preserved in other ways. Depending on your system, you may also be able to connect the phone with the USB cable and import the video with utilities like Microsoft’s Photos app for Windows 10 or Image Capture (or Photos) for the Mac. If you prefer to stay wireless, you have other avenues, like uploading the video to iCloud Photo Library or a social media site; some sites may compress the clip, though. Mac users can beam files from their iOS devices to their Macs using Apple’s AirDrop feature. AirDrop can also be used to send files directly to other iOS devices. 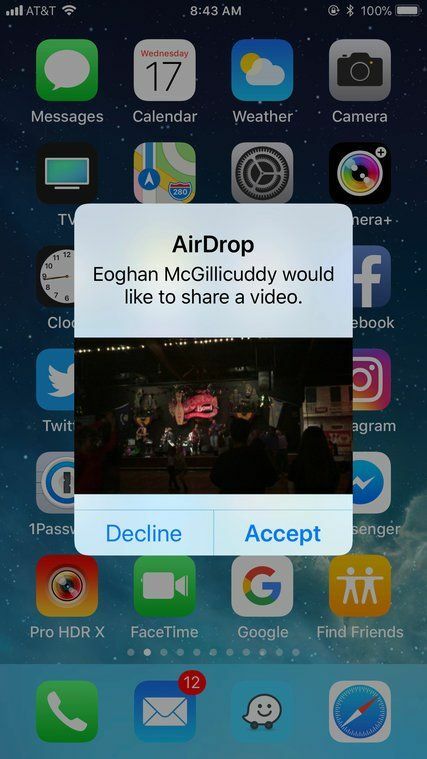 If AirDrop is not an option, online file-sharing services can help move the movie. The iOS Mail Drop feature for sending large attachments allows you to store a file up to five gigabytes in size if you use Apple’s Mail app and iCloud service. While videos can also be stored on iCloud and streamed by other users, Apple limits the clip length to five minutes. Uploading the file to another online sharing service like Google Drive, Microsoft OneDrive or Dropbox can both store a copy of the video online and allow you to share it with others who can stream it on their own devices from a sharing link you provide. Video-editing apps like iMovie, which Apple includes free with new iOS devices, can be used to export clips at lower resolutions for easier sharing among devices or uploaded to social media sites. And although last year’s solar eclipse took place in August (about a month before Apple released its iOS 11), keep in mind that photos and videos captured with iOS 11 might be in newer formats that are not yet compatible with every device or file-sharing service out there. You might need to convert the clip to an older file type to share it.